Are classes for women only or do you offer to men and children as well? 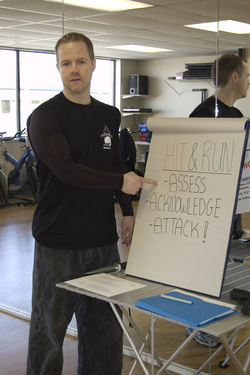 Hit and Run Self Defense strategies are effective for women, men and children. As such, women only, co-ed and family classes are offered throughout the year, weekly, on-site, privately and publicly. Weekly classes are offered for 5-8yr old, 8-15yr and 15yr+ (teens/adults). Children must be of 10 years of age or older to participate in the 2hr "workshop" or attend with a guardian. Do I have to be physically fit to attend? Classes are designed for all sizes and levels of physical fitness. You must however be mentally competent, in good health, and have no disability or medical conditions which might make participating in physical activities inadvisable. There is light exercise, stretching and striking of pads using martial arts movements. What level of contact is there in the workshops? There is no sparring or attempts to hit other students. We create an enjoyable learning atmosphere and all techniques are to be performed with control/minimal force when working with a partner. There is some physical contact through the execution of grabs, holds, joint locks, choking and ground controlling positions as well as the applicable self defense techniques to overcome them. Participants should wear comfortable stretchy or loose fitting clothes. Do you travel to provide workshops? Yes, a workshop can be offered by request to any location, should you wish to arrange a seminar. Fees will vary based on location, travel cost and the number of participants. Please contact us to arrange or discuss. Can I just carry a weapon to improve my odds? You cannot legally carry a firearm, pepper spray, or any other concealed weapons like knives, brass knuckles, etc. in Canada. These are items often not readily available when you need them and that can even be used against you in an attack. You can however learn to quickly improvise under duress situations. Do you offer workshops exclusively or can I attend a regular weekly class to stay sharp and keep evolving my street survival skills? Many requests are for workshops as people can learn a great deal of life changing skills in one or two seminars. For those that understand the advantages to physical fitness and continual practice, we do offer bi-weekly classes through our studio as well as the City of Richmond and various community centers throughout Vancouver. These fun classes introduce advanced techniques, exercise, environmental training and options to address increasingly more difficult attack scenarios. Please see "Krav-Jitsu" under the "Class & Workshops" Menu for bi-weekly sessions. Or Call: 604- 447-4357 for more information regarding our clubs. Should I always fight back if physical or sexual assault is imminent? Yes, but not necessarily immediately. The first few seconds of an encounter are critical. You do want to strike first if harm is imminent and you certainly never will allow yourself to be taken to an alternate location, but if someone has the complete upper hand, you may need to verbally diffuse, set a false sense of compliance/confidence and attack when an opportunity better presents itself. Each situation is unique and although there are some rules you must not break, you also want to be practical and creative to ensure your safe escape or survival. Should I teach my friends and family what I have learned at the workshop? -Without instructor experience, you can teach them incorrectly or in ways not suitable to their body type. -They will not understand the physical/mental changes; mind set required, suitability of technique to different aggression levels or the potential legal ramifications. -Unfortunately, more than half of women assaulted are victims of someone they had a relationship with (married, common-law, dating, divorced, social groups, etc.). Knowing these statistics and appreciating that relationships can evolve, it is not in your best interest to share your training and intimate self defense knowledge. The element of surprise is a very powerful tool. Links from Hit and Run Self Defense to third-party sites do not constitute an endorsement to or from any 3rd Party. All logos, images, media, publications and intellectual property are the sole ownership of the company shown.